Two frame plates from were ordered fron Corus Steel Cradley Heath at the beginning of October 2008. 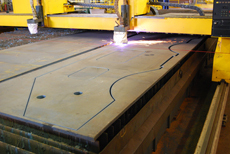 The construction phase of the Project began on 31st March 2009, when when two frame plates were cut at Cradley Heath. 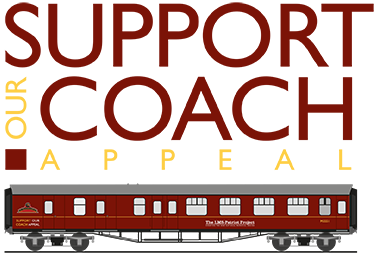 Measuring 39' in length, around 4' high, and 28mm thick (1 1/8") the two main frame plates were Plasma cut to the required shape. This was a continuous process using a CNC machine which had previously been programmed with frame dimensions from drawings that had been produced by Pete Rich. 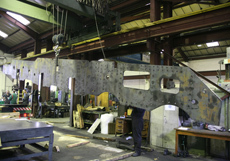 The frame plates were then transported to the nearby Boro Foundry where drilling and machining tookt place. Over 300 holes on each plate have been drilled. The frame plates were then taken to the Llangollen Railway Works, where assembly is taking place under contract with Llangollen Railway Engineering and Dave Owen, CME at the Llangollen Railway Works. The drag box was completed during December 2009. Steel plate was delivered to Llangollen Works in pre-cut sections where coded welder Ian Massey welded the sections together to form the new dragbox. This was heat treated off site to equalise the stresses within the newly welded structure. The dragbox was then returned to Llangollen for fitting in the frames, at the cab end of the locomotive. Buffer beams were also made and these were fitted to the front and rear of the frames. Drawings for the frame stretchers have been produced by Kevin West, LMS-Patriot Project draughtsman and patterns were ordered in January 2010 from master pattern maker Eddie Mocroft at The Boro Foundry. 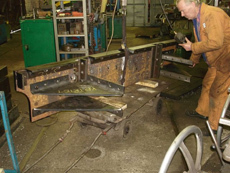 By March 2013, all five frame stretchers had been cast, machined and delivered to Llangollen. These were fitted to the frames of 'The Unknown Warrior' at Llangollen in Summer 2013 . 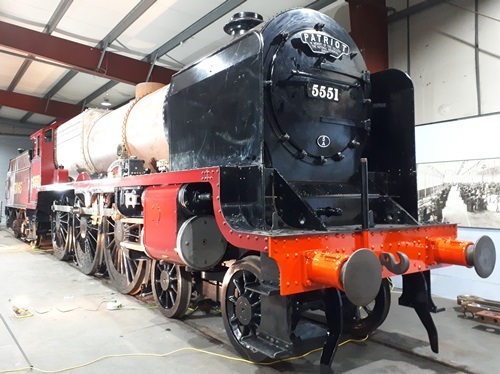 On 20th November 2013, 'The Unknown Warrior' was wheeled outside the Llangollen Railway Works, before being transported to the West Midlands in time for display at The National Memorial Arboretum and the Warley National Model Railway Exhibition at the NEC.